CLICK PLAY BELOW to DISCOVER the story of this amazing story! You’ll be treated to a sample of the audio book, illustrations, story description, behind the scenes insights, AND interviews with kids and parents who’ve been on the Mrs. Amazing and The Seed adventure. “Mrs. Amazing and The Seed” is a fiction – science – fantasy piece for kids 9-12+. It takes readers on a fantastical romp with a family that refuses to conform to the pressures of the elite powers that seek to control their kids. Risking everything to be different, they enter a transformative realm that is wildly mysterious, creepy, and wacky. The book not only explores the miraculous world of botany but also the very nature of life itself! At a time when belief in anything out of the ordinary is not tolerated, Faye and Frank Faultsom are daring to be different. Determined to guide their four free-spirited children on a risky quest to enter the mysterious and mystical realm known only to them as Wonder, they attract the malicious attentions of the sinister Ms. Imperia Beasley, Director of the local Grown Up Factory, where helpless children are conformed to the Prescribed Order as their imaginations are crushed. When one of Faye’s wacky schemes to help her kids discover Wonder precipitates a predicament that threatens to tear their family apart, a bold act of belief catapults the Faultsoms into a bizarre and often comical world in which they experience the energy of a strange and overwhelming Life Force. Just when they begin to understand its compelling beauty and power, the family learns they must return home to face a heartbreaking crisis — a crisis that may result in their teenage daughter losing Wonder forever. "Mrs. Amazing and The Seed"
And, it begins on January 2, 2019! Here’s what your family or loved-ones will experience! “Mrs. Amazing and The Seed.” Shipped to you ASAP. (Mrs. A fans say that they want to read the book again and again! with illustrations and a read-along chapter! Mrs. Amazing story and experience. PLUS a few surprises along the way! WOW! That’s a lot of great stuff delivered to you for 28 days! The biggest value of all will be the power of the amazing seeds planted in your kids and young loved-ones. They will grow such good things in their hearts and minds - and in yours! 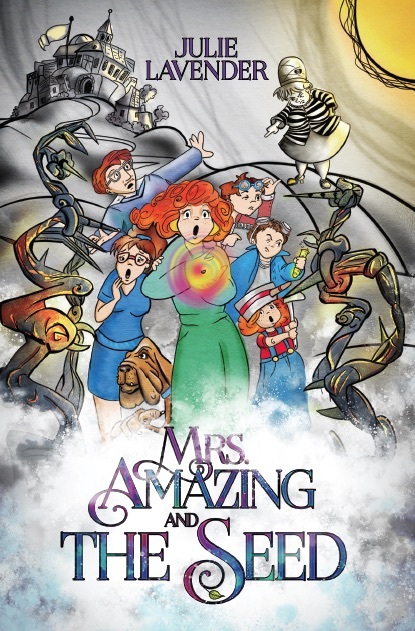 Mrs. Amazing is exceptional quality youth fiction that is fun, educational, empowering and uplifting. “I can’t wait for it to be a movie. "We bought this for the autistic daughter of some friends of ours for Christmas. She is a "bookworm" and told us that she read it twice in January, it was that good!" An autographed copy of the book plus the entire 3-WEEK-PLUS “Mrs. Amazing and The Seed” Multi-media Adventure beginning on January 2, 2019 is easily a $45 value . . .
but is yours to enjoy for $34.99! BUT WAIT! Do you have a discount coupon? Just want to order the book? Scroll down! Your multi-media order includes FREE SHIPPING by media mail (5-7 days, except during holidays). Order is to be shipped internationally via First Class mail. Do you want the full experience and not just the paperback book? Click here to purchase the full experience. Do you want the full experience and not just the electronic book? When should the 3+weeks of emails start? Just want to order the book? Paperback price is $12 plus $5 shipping and handling (via media mail), priority shipping is $10. Click here for the physical book. Would you prefer the e-book for your Android/iOS phone, Kindle, or computer? It's only $9.99 and you can download it instantly. Click here for the electronic book if you only want the e-book. Prefer to get a daily email, the book, and a full PDF at the end of the daily emails? Click here if you want the full experience. You have entered an email address at CHARTER.NET. Please be aware that we might not be able to deliver emails to Charter.net and recommend that you use an alternate email address such as Gmail.com to ensure deliverability. DreamFarm Radio ("us", "we", or "our") operates the http://dreamfarmradio.org website (the "Service"). © 2019 DreamFarm Vision and Julie Lavender. All Rights Reserved.